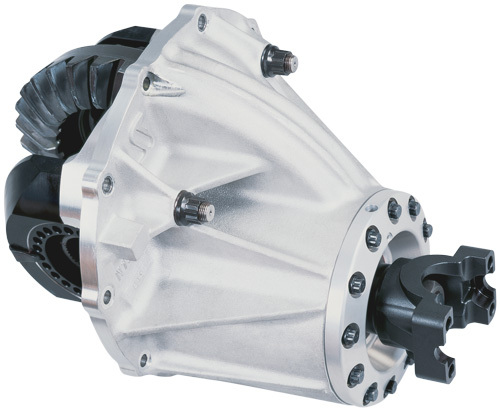 The heavy-duty, aluminum 9 Ultra Case is engineered to provide better lubrication to the pinion bearings and easily accept 9.00 Drag Competition gear sets. The Ultra Case incorporates a uniquely designed pinion support that connects with the case to provide superior ring-and-pinion life. Four chromemoly studs are encapsulated by billet caps, allowing for shorter and stronger studs. The tail bearing is larger than factory, which can withstand greater rpm speeds and is secured by a special retainer plate. Ultra Cases provide superior strength through encapsulated cap studs, a larger-than-stock tail bearing, 12 pinion-support bolts and a unique casting design, which provides strength and optimizes bearing lubrication. The Ultra Case and Drag Competition gear set are designed for drag-racing purposes only.